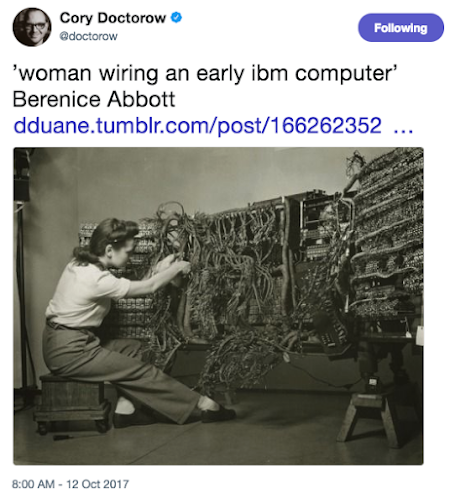 A common photo on Twitter shows a woman wiring an early IBM computer. The image is from photographer Berenice Abbott who took many scientific photographs from 1939 to 1958. She photographed everything from basic magnetic field and optics experiments to research on early television tubes, and many of these photos were used in physics textbooks. Her photos (including IBM photos) were published in the book Documenting Science. I had hoped that the book would identify the computer in the photo, but it merely said "IBM Laboratory: Wiring an early IBM computer". Surprisingly for an art book, it didn't even give a date for the photo. 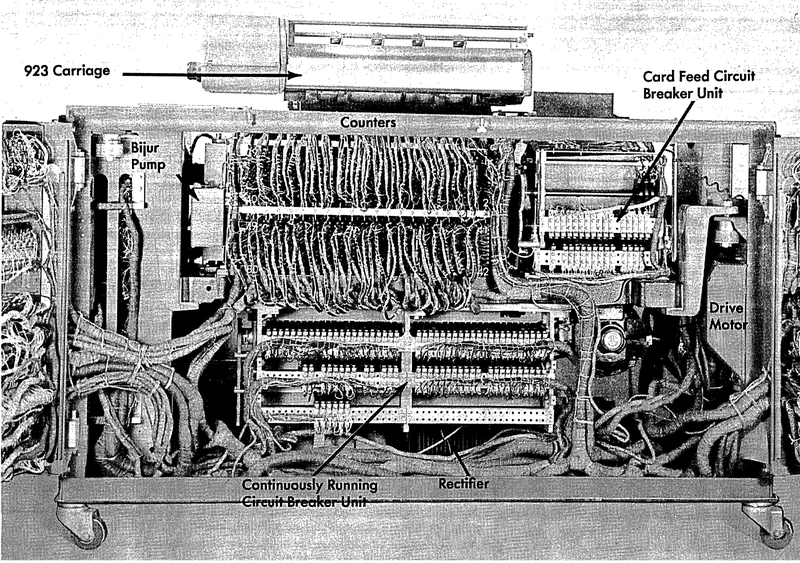 The diagram below shows the back view of an IBM 403 accounting machine, which IBM introduced in 1948.2 (An accounting machine (also called a tabulator) summed up and printed records from punched cards for applications such as payroll or inventory.) Note the similarities with the Abbott photo: the thick laced wire bundles, the vertical wire bundles in the middle for the counters, and the hinged doors that swing open. Back view of an IBM 403 accounting machine. From the IBM 402/403 Field Engineering Manual. A second Berenice Abbott photo shows the machine from a slightly different angle.3 The "Card Feed Circuit Breaker Unit" in the upper right looks like a perfect match between the IBM 403 and the Abbott photo. The dangling cables from the counters in the middle look right, as well as the thick cable between the counters and the circuit breaker unit. The 403 diagram above shows a large printing carriage on top, while the Abbott photo just shows a base, presumably because the carriage hadn't been installed yet. 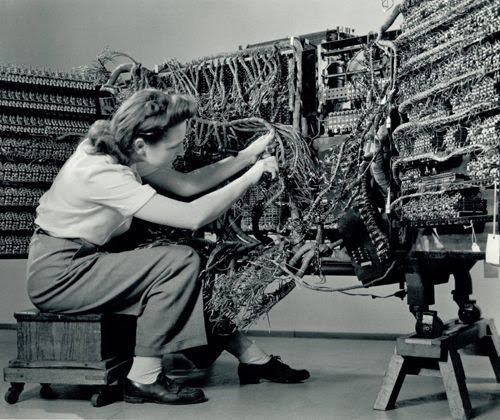 A second photo of "Woman wiring an early IBM computer" by Berenice Abbott. Although the machine in the Abbott photo looks very similar to the IBM 403, there are a few differences if you look carefully. One clear difference is the IBM 403 had caster wheels attached directly to the frame, while the machine in the photos has stubby curved legs. In addition, the doors of the IBM 403 were hinged at a different place. In the Abbott photos, the doors are attached just to the left of the counters and to the right of the card feed circuit breaker unit. But the IBM 403 has some bulky components to the left of the counters such as the "Bijur pump" (an oil pump), and components on the right such as the drive motor. Overall, the machine in the Abbott photos has a narrower cabinet than the IBM 403. Additionally, the thick cable snaking down between the IBM 403's circuit breaker units appears to go straight down in the photos. Thus, although the machine in the photos is very similar to the IBM 403, it's not an exact match. An IBM 405 accounting machine. Photo courtesy of Columbia University Computing History. Punched cards were a key part of data processing from 1890 until the 1970s, used for accounting, inventory, payroll and many other tasks. Typically, each 80-column punched card held one record, with data stored in fixed fields on the card. The diagram below shows a typical card with columns divided into fields such as date, vendor number, order number and amount. An accounting machine would process these cards: totaling the amounts, and generating a report with subtotals by account and department, as shown below. 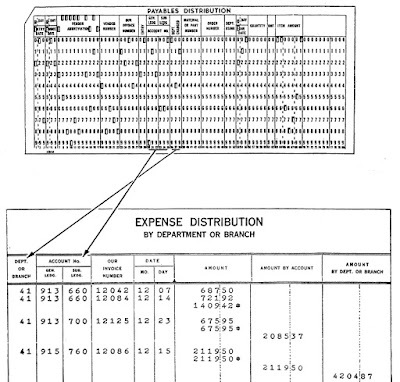 Example of a punched card holding a 'unit record', and a report generated from these cards. The accounting machine can group records based on a field to produce subtotals, intermediate totals, and totals. From Manual of Operation. Punched-card data processing was invented by Herman Hollerith for the 1890 US census, which used a simple tabulating machine to count census data, stored on punched cards. 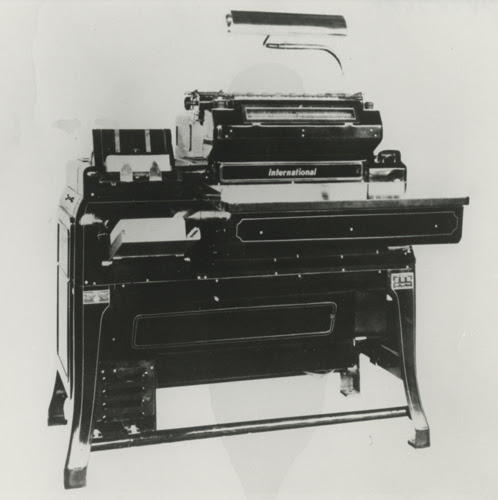 Tabulating machines steadily became more complex, becoming feature-laden "accounting machines" that could generate business reports. Businesses made heavy use of these electromechanical accounting machines and by 1944, IBM had 10,000 tabulating and accounting machines in the field. 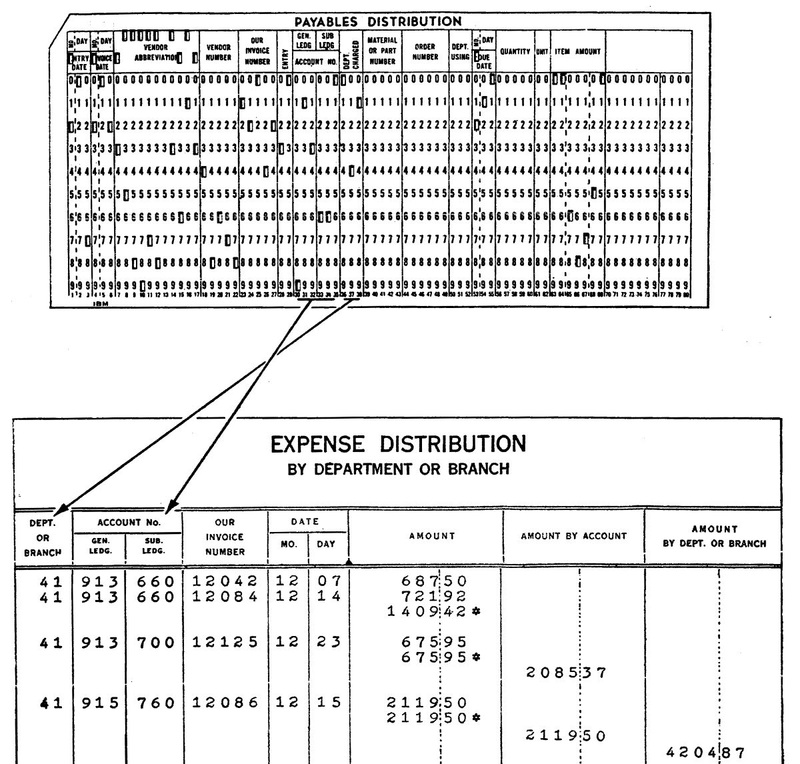 Plugboard to generate a tax report on an IBM 403 accounting machine. Courtesy of Carl Claunch. How does an accounting machine work and what are all those parts? 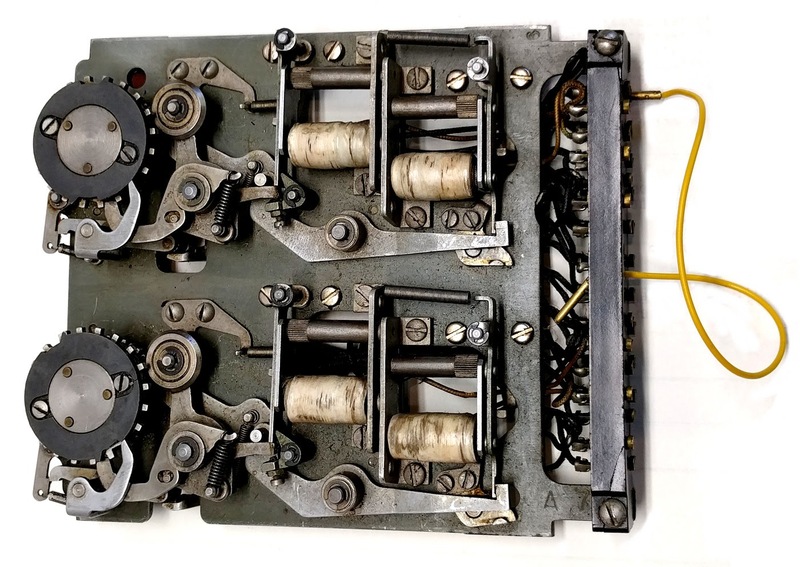 Accounting machines (also called tabulators) were built from electromechanical components, rather than transistors or even vacuum tubes. The main components in accounting machines were electromechanical counters and relays. Everything was synchronized to rotating driveshafts that ran the counters, card reader and printer. In a way, accounting machines were more like cars than computers, with a motor, clutches, driveshafts, an oil pump, gears and cams. 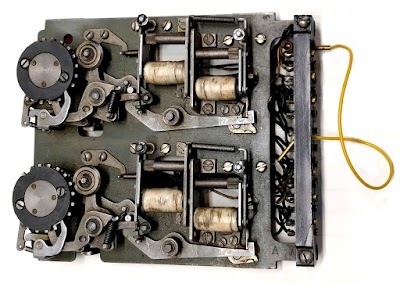 The heart of the accounting machine was the mechanical counter, a digit wheel somewhat like an odometer. Each wheel stored one digit, with the value indicated by the rotational position of the wheel. To add a number, say 3, to the counter, a clutch was briefly activated, causing the drifeshaft to rotate the counter three more positions. Since these counters were adding 2 1/2 numbers per second, they were spinning rapidly with the clutches engaging and disengaging with precision timing. By combining multiple counters, numbers of up to 8 digits could be handled. The counter kept a running total of the numbers fed into it. Since it accumulated these numbers, the counter was known as an accumulator, a term still used in computing. A counter unit from an IBM accounting machine. The two wheels held two digits. The electromagnets (white) engaged and disengaged the clutch so the wheel would advance the desired number of positions. The photo above shows a board with two counters: the two wheels on the left stored two digits. The counters are more complex than you might expect, with electromechanical circuits to handle carries (including fast carry lookahead). The clutch is underneath the wheel and is engaged by the metal levers in the photo, controlled by electromagnets. A gear underneath the clutch connects the counter to the driveshaft. The electrical connections on the right control the clutch and allow the values from the counters to be read out. 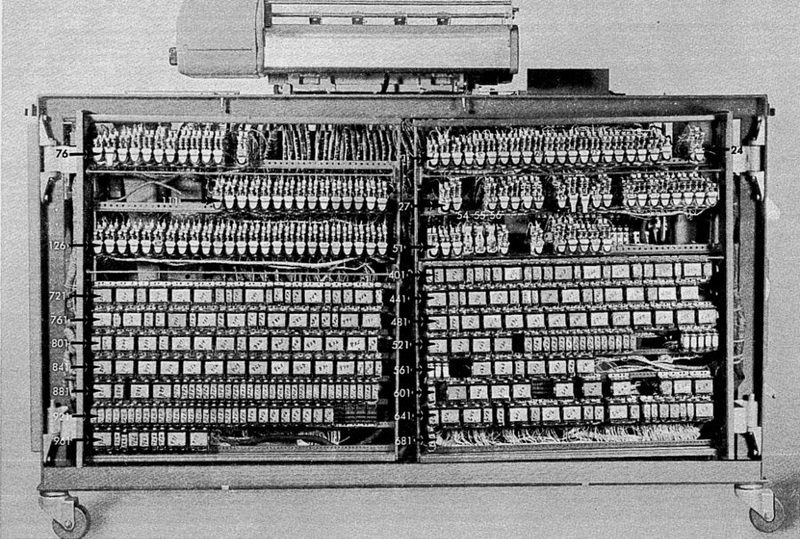 Since the IBM 405 had 16 accumulators, with up to 8 digits, many counters were required, resulting in the mass of counter wires in the photos. Another key component of the accounting machine was the relay, an electromagnetic switch. The control logic of the accounting machine was implemented with hundreds of relays, which would turn on and off to direct the various components of the accounting machine. Example relay functions are switching on when punched cards are in the input hopper, selecting addition or subtraction for a counter, generating the final total when all cards are done, or printing a credit symbol for a negative balance. 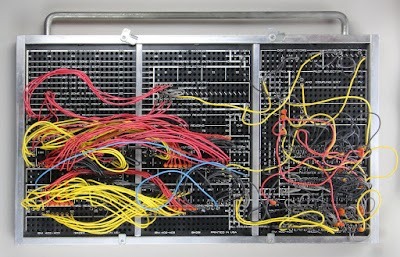 The back of the IBM 403 accounting machine shows numerous relays, used to control the machine. The relays were mounted on swing-out panels. The photo above shows an IBM 403 with the panels closed. In the Abbott photos the relay panels are opened and you can see the extensive wiring that connected the relays to the rest of the system. The photos also provide a glimpse into the era before digital computers, when businesses used electromechanical accounting machines and tabulators for their data processing. 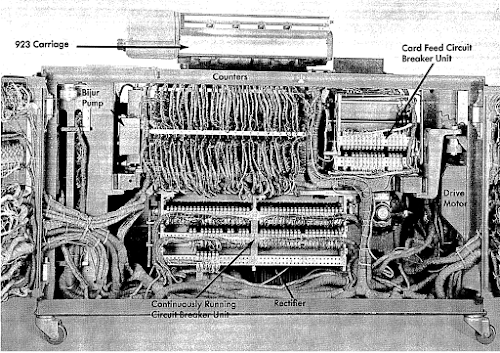 Although you'd expect a machine from 1934 to be primitive, the IBM 405 accounting machine in the photos was an advanced piece of technology for its time, containing 55,000 parts and 75 miles of wire.5 These punched card machines were also capable of performing complex scientific tasks, even contributing to the Manhattan Project. In the 1960s, businesses gradually switched from accounting machines to stored-program business computers such as the IBM 1401. Even so, IBM continued marketing accounting machines until 1976. I couldn't find any manuals for the IBM 405 or photos of the back of a 405, so I can't totally nail down the identification. 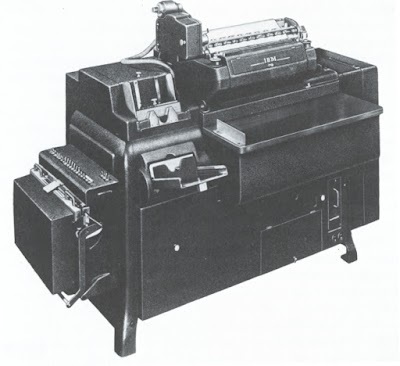 There's a possibility that the Abbott photos show an IBM 401 accounting machine (below), which was similar to the 405 but introduced a year earlier. The IBM 401 and IBM 405 both had the same basic shape and arrangement of components. The main difference is 405 had a full cabinet in front while the 401 was empty in the front with a bar bracing the front feet. The Abbott photos seem to show a full cabinet like the 405, rather than the open 401. Also, since the 405 was a much more popular machine than the 401—the 405 was the "flagship of IBM's product line until after World War II"—the photos are most likely the 405. 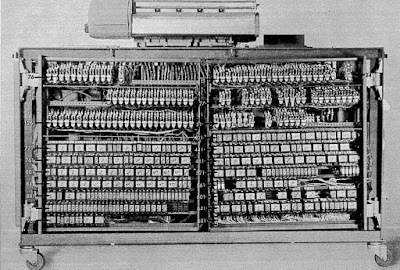 IBM 401 accounting machine (1933). Photo courtesy of Computer History Museum. I still have an original plugboard. I got it from IBM as a thanks for a service provided. I arrived at my first job in 1970 to see the IBM 403 Tabulator being hauled away. There was an oilpan under the machine. I see a Bijur pump in one pic that is an oiler that pumps a couple times per hour, depending how it's set. I mentioned this article to some retired University of Michigan Computing Center buddies and all reminisced ! In particular, "I’m surprised the article didn’t mention the 407 in an otherwise fairly complete overview of IBM 40x machines. I think the 407 was the last machine of that sort IBM made and was their flagship for quite a long time. There’s a good Wikipedia article about it at https://en.wikipedia.org/wiki/IBM_407. 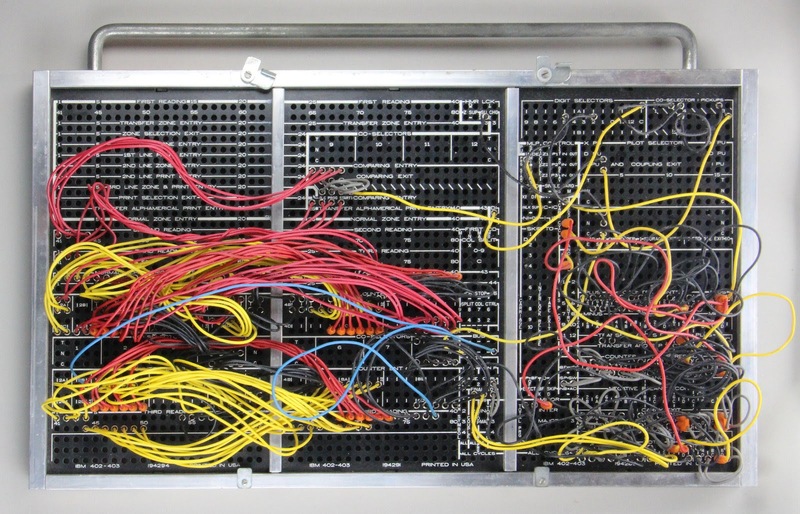 Tom McBride and I spent quite a lot of time wiring one of these for a job we had briefly in Houston. They were more complex than you might think and with a little bit of imagination you could make them do a lot." Thanks for the info gavineadie. I didn't intend for the article to be an overview of all the accounting machines. Since the 407 clearly wasn't the machine in the photo, I left it out of the discussion. It is an interesting machine, though. By intro, I am a retired IBMer. Excellent piece of analysis by you. When I lived in Poughkeepsie, NY in the early 1980s I was told by neighbors that IBM used women to wire computers in the 1950s through the 1960s, because they paid more attention to details then men, and many knew how to knit (e.g., older women). My father began working for IBM in 1927. Later will tell where. I started in IBM in 1957. Both of us were "Customer engineers" (repairmen) . My father was Manager of the service division. We worked on 405'S, 420'S and 421'S, all accounting machines. Also 602A: this was a calculator. By 1962 I learned programming for the 1401 series, and worked as coder at first and in almost all duties related to computers (360, 370, 390) until 2011.